A little Halloween craft fun. Last year I made the two skeletons using papier-mâché and this year I made a little scene for them to inhabit using the back of a deep wooden panel. The panel was first painted, then the tree was cut from cardboard with papers pasted on and painted to give texture. The leaves I made from my hand-painted papers and using the Tim Holtz ‘Garden Greens’ dies with my Sizzix Big Shot. The deer I bought from Flying Tiger last winter with this project in mind. The panel is fairly large and measures 50 x 40 x 5 cm. Not quite complete yet. Just want to add something else but not sure what just yet! After enjoying making a few small foldable boxes last year (not sure what to call these!) I've tried scaling up. This one is 38cm high and I've used several printmaking techniques for most of the pieces - screenprint, cyanotype, etching and monoprint. I like that this can be displayed flat or open. Some of my work displayed at RK Burt this week as part of a group show. Six monoprints with collage. A small, 11.5 x 9.5 cm when closed (34.5 x 9.5cm when open) artist book for sale in my online shop. 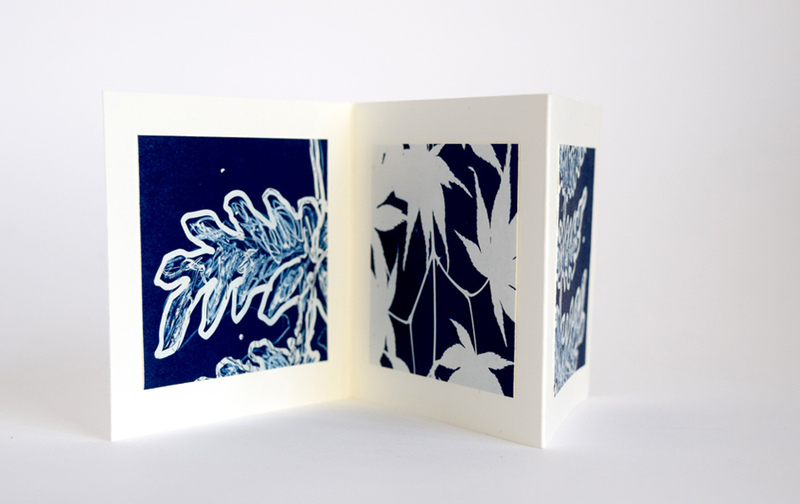 Using the old photographic process of cyanotype to print my drawn negative and contact print of leaves. 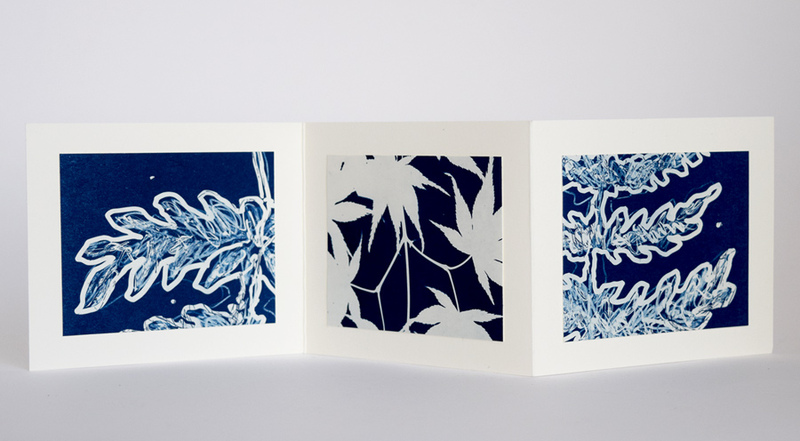 The three cyanotypes are glued onto 300gsm paper. Some of the new screeenprints I printed recently. Part of two small varied editions. Three solar plates printed side-by-side on buff coloured paper. Some old finds from deep in my plan chest. I'm gradually going through it with the hope of clearing out some older work so I have space for the new.